Cannabis and Fibromyalgia: A Potential For Treatment? With a growing demand for natural and inexpensive treatments that are safe, many are now looking to see what cannabis has to offer. This is especially the case for treating Fibromyalgia. Cannabis has been in the spotlight of the medical industry for a while now. If you didn’t already know, cannabis naturally produces hundreds of cannabinoids and terpenoids that have a beneficial interaction with the human body. The endocannabinoid system (ECS) in the human body is what makes this possible; it is a complex network of naturally occurring cannabinoid receptors located in the nervous system, brain and all over the body – all of which interact with the compounds of cannabis. The endocannabinoid system has an important function in our body, regulating vital life functions including mood, sleep pattern, inflammation, appetite, pain sensation and memory (to name a few things). Cannabis produces several types of cannabinoid that are known to fit like lock and key with cannabinoid receptors in the endocannabinoid system - hence they have the ability to trigger our body to carry out different processes. The two main cannabinoid receptors in the endocannabinoid system are CB1 and CB2. CB1 exists mainly on neurones in the brain, nervous system and in certain organs and tissue such as the spleen and heart. CB2 receptors exist mainly on immune cells called Microglia where their function remains predominantly unclear; however, they do play a role of pain relief in the brain. It is no wonder that cannabis has such a plethora of positive health benefits when you consider these facts, cannabinoids simply aid in the functions of the endocannabinoid system within the human body. Fibromyalgia is a medical condition which produces all of the symptoms listed above. The cause of this condition has long been debated, but researchers are starting to link such symptoms with the endocannabinoid system. Russo wrote expanding on his original CEDC (clinical endocannabinoid deficiency) paper where he pointed out that the ECS links your brain to certain body parts and functions; hence, an imbalance of cannabinoid in our body could cause the communication to become disrupted. He explained that THC fills in for our body’s own natural endocannabinoid – anandamide, which reduces hypersensitivity. A study conducted by Dr Mary-Ann Fitzcharles, a professor of medicine at McGill University investigated the medicinal benefits of cannabinoids on 302 fibromyalgia patients and 155 patients with another chronic pain disorder. They found that 72% of patients claimed to need about 1 gram of cannabis a day or less in order to feel significantly reduced pain in their lives. The success rate for common prescription treatments is about 8-10%. This is great news as it means that there is a potentially healthier and cheaper alternative which could be used with opioids in tandem or as a possible replacement. Muscle spasms, tightness, and sleeping troubles are the defining characteristics of FM. Trigger points lying underneath contracted muscles can cause pain in different parts of the body when pressed; this means that muscle spasms are more likely to happen at night, interrupting sleep patterns. Night time medication of cannabis could extend your deep sleep cycle and helps you to fall asleep. The CBD (a non-psychoactive compound) found in cannabis was found to help treat symptoms of Multiple Sclerosis (MS) injected in lab mice, and has since been further investigated as a treatment for many twitchy-muscle/pain related symptoms. This too has implications for FM sufferers. It just goes to show, in our hunt for potentially safe, inexpensive and effective treatments, cannabis could be at the forefront. Most evidence regarding cannabis and fibromyalgia is anecdotal, but the research that has been conducted is certainly positive, with more extensive studies surely in the pipeline for the future. Who knows, one day, cannabis could be named the answer we have been looking for. 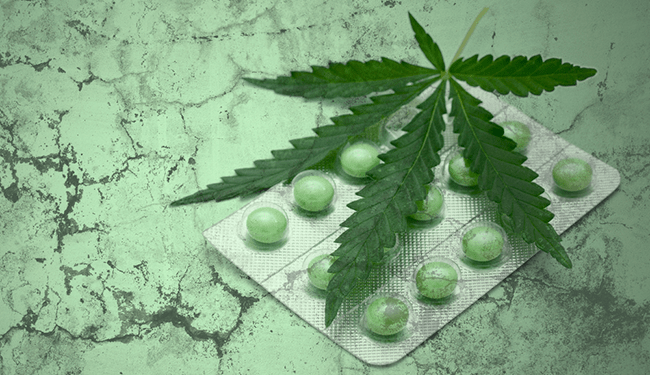 Can Cannabis Help Treat The Symptoms Of Haemorrhoids? When And How Often Should You Take CBD?